It’s tough to write a powerful science fiction piece that is politically themed, and keep it interesting (to me, at least), but author Malka Older accomplishes just that in this political sci-fi thriller, Infomocracy. For political purposes, the world is divided into “centenals” of about 100,000 people. Each centenal votes for its own government. There are a number of political parties out there – PhilipMorris is one of the larger parties, but there is also EarthFirst and Heritage parties (among others). The parties that win the most centenals become the Supermajority, which gives them more political clout. A world-wide vote is held only once every ten years and the third such vote is approaching in just over two weeks. The parties are busy lobbying and doing whatever they can to gain control. The book follows four characters. One is an undercover agent for the Policy1st party – hoping to move up the ladder within the party. One is a spy for Policy1st, using subtle means to draw people into conversation and trying to get the inside dirt on the competition. Another is an anti-government anarchist hoping to bring down the entire corrupt system. And the last works for a super powerful on-line service (ala Google) that is used to communicate instant information about the elections. The first part of this book does a lot of setting up of the background the reader needs to know about this future world. The political parties, their ambitions, the lengths they’ll go to in order to win on the smaller levels … this is all necessary background. It gets a little dry at times because it’s such a large info-dump, but Older works hard at keeping the reader interested with what the characters are doing. I was particularly fascinated by Mishima (the worker for the internet information engine). The immediacy of information in our world today is taken for granted, and as it becomes speedier and speedier, it will likely cause as many problems as it overcomes. Just look at how our own media reports results of elections before the results are all in. Older does a fine job creating very different people but all of whom we want to follow through the story (though we are hoping that there will be a crossing of paths along the way). She also weaves a tight series of stories under the larger theme of politics and information. Older manages to make this theme seem nascent , despite the fact that politics is as old as modern man. Perhaps it is because this seems particularly relevant in light of the United States’ factious, up-coming election as well as England’s recent vote to leave the Euro (the vote which happened the day I finished reading the book). As I think about it, I’m surprised that there aren’t more sci-fi stories that lean heavily toward politics (without getting preachy to one side or another). This is a powerful debut novel and I’m sure it will gain some traction as the U.S. elections get messier and more involved. I look forward to seeing what Malka Older brings next. Looking for a good book? 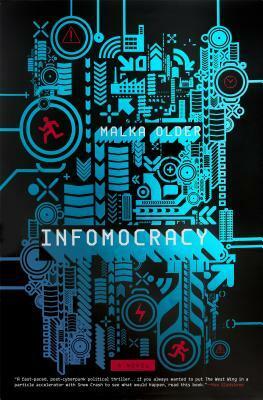 Malka Older manages to write a captivating sci-fi thriller about politics and the race for information with Infomocracy.